A 19-lb. turkey makes for an impressive centerpiece for a holiday celebration or party and provides enough meat to feed a crowd. If you estimate that each person will 1 1/4 lb. of turkey, your 19-lb. turkey will serve 15 people. Your challenge in cooking such a large bird is to make sure the thigh meat is completely done while not drying out the breast and overbrowning the skin. Roast your turkey to perfection to ensure it is both juicy and completely cooked to prevent foodborne illness. Remove the turkey from the bag and pull the bagged giblets and neck out of the turkey. Lift the turkey and place it in the roasting pan, breast side up. You may need to use both hands, as the turkey is heavy and slippery. Tuck the wings underneath the turkey. Rub the butter over the turkey. Insert the thermometer into the deepest part of the turkey's thigh. Place the pan in the oven and roast for two hours. After two hours, cover the breast and thighs with aluminum foil to prevent further browning. Continue to roast the turkey for another 90 minutes. Check the thermometer. If it reads 180 degrees Fahrenheit, your turkey is fully cooked. 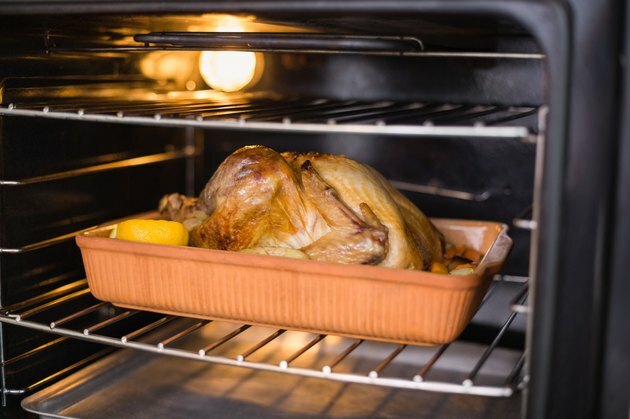 If it reads less than 180 degrees, continue to roast the turkey and check the thermometer regularly until it reads 180 degrees. Lift the pan using the oven mitts. The turkey and pan will be extremely hot. Rest the turkey for 15 minutes before carving. Thaw a frozen 19-lb. turkey in the refrigerator for four to five days. You can thaw a 19-lb. turkey in eight to 10 hours by submerging it in cold water. Change the water every 30 minutes.